•*Raising calcium levels in people who have low calcium. •*Reversing high potassium levels, when given intravenously (by IV). •*Use as an antacid as calcium carbonate. The National Osteoporosis Foundation says, "Calcium plays an important role in building stronger, denser bones early in life and keeping bones strong and healthy later in life." The bones and teeth contain over 99% of the calcium in the human body. Calcium is also found in the blood, muscles, and other tissue. Calcium in the bones can be used as a reserve that can be released into the body as needed. The concentration of calcium in the body tends to decline as we age because it is released from the body through sweat, skin cells, and waste. In addition, as women age, absorption of calcium tends to decline due to reduced estrogen levels. Calcium absorption can vary depending on race, gender, and age. Calcium is an important component of a healthy diet and a mineral necessary for life. Vitamin D is added to our calcium supplements. Proper vitamin D status is important because vitamin D is converted to a hormone in the body, which then induces the synthesis of intestinal proteins responsible for calcium absorption. "Milk Calcium" is the unique calcium supplement made from nature's most basic food, milk. The combination of calcium and vitamin D is essential in maintaing bone health. 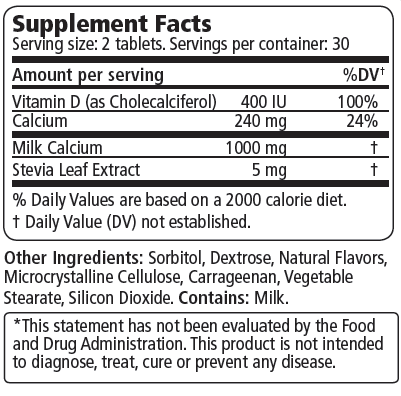 Directions:As a dietary supplement,take 2 tablets daily with food. Warning:Consult your physician before using this product if you are pregnant,nursing,taking medication,or have a medical condition.Discontinue if any adverse reaction occurs. Pregnancy and breast-feeding: Calcium is likely safe when used in recommende amounts during pregnancy and breast-feeding.